Christmas has arrived early for at least four former Atlantic League pitchers and one outfielder. They have new invitations to major league spring training camps, but that is only part of the story. For two of the hurlers, Somerset's Buddy Boshers and Dan Runzler of Sugar Land, the invitations to train at baseball's highest level come less than three months after they played their final game (at least for now) in the Atlantic League. There is no starting out in the minor leagues for relievers Boshers and Runzler. These left-handers go direct the Minnesota's major league camp since the Twins have a need for more left-handed relief pitching. They will compete for jobs on the 25-man Opening Day roster. Outfielder Joe Benson, who played briefly at Sugar Land in July, and right-handed pitchers Jarrett Grube and Greg Burke, whose Atlantic League time dates back a few years, also received invitations from major league teams. Boshers helped Somerset corral its record sixth Atlantic League championship, striking out 71 hitters in only 54 innings spread over 52 appearances. He has "a really good breaking ball, which he will even throw 3-0," praised Patriots manager Brett Jodie. Boshers now has a chance to add to the major league experience he already has with the Los Angeles Angels. Sugar Land pitching coach Jeff Scott was convinced at season's end that Runzler "belongs in a major league camp" in 2016. Released by Arizona toward the end of July, the former major leaguer dazzled out of the Skeeters' bullpen, using an excellent slider and curve and hitting the upper 90s on the radar gun. He had a 0.52 earned run average for his 19 appearances. He last pitched in the majors for San Francisco in 2012. Benson, 27, who has bounced around five different major league organizations the last three seasons and played in five games for the Skeeters (4-for-20, one RBI), is returning to the Twins, who drafted him in the second round in 2006 and called him up for 21 games in the '11 season. Grube, who was with Southern Maryland in 2009 and 2010, re-signed with Cleveland which should not be surprising since the 34-year-old went 9-0 with a 2.26 ERA in 15 games (13 starts) for the Indians' top farm club in Columbus, OH after starting last season in the Mexican League. He has only one previous major league appearance with the Angels in '14. Burke started his professional career in the Atlantic League (Atlantic City, NJ) when he came out of Duke University in 2005. Now 33, he will train in Florida with Philadelphia, hoping to add to his major league resume that already includes 80 relief outings. He struck out 66 batters in 61.2 innings while posting a 5-1 record with Toronto's top two farm clubs this past season. "I'm so emotional now. I wish it was April." These were the words of veteran Luis Rodriguez at his introductory media conference as manager of the Bridgeport Bluefish after 22 seasons as a professional player. 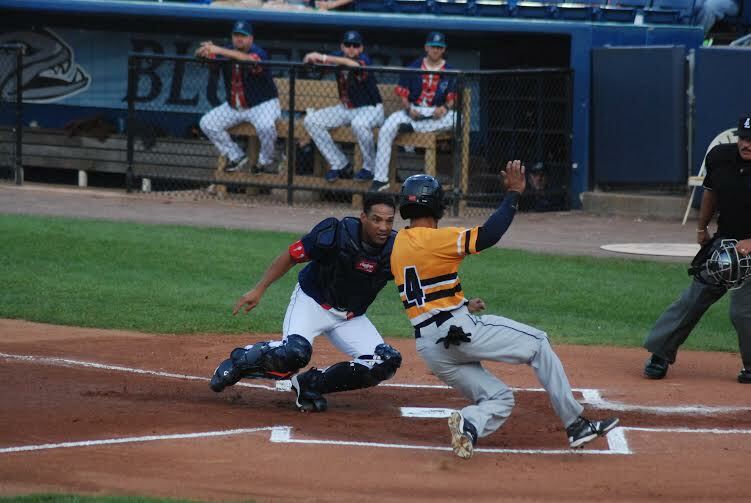 The 41-year-old native Venezuelan who now calls Binghamton, NY home has nine championship rings from his days as a catcher, including 2004 with the Long Island Ducks, with No. 10 his clear goal for the future with the Bluefish, for whom he played since '08. "I want to get it done," he said, explaining he expects to build a team that will start with pitching, then defense. "Offense will come along, and we shouldn't have mental errors." Rodriguez confirmed he will not be a playing manager after appearing in 1,749 games since 1994. "That's a lot of squat", he said with a smile.